Despite his astuteness in dealings with matters at home, Osorkon II was forced to be more aggressive on the international scene. The growing power of Assyria meant the latter's increased meddling in the affairs of Israel and Syria – territories well within Egypt's sphere of influence. Osorkon II devoted considerable resources into his building projects by adding to the temple of Bastet at Bubastis which featured a substantial new hall decorated with scenes depicting his Sed festival and images of his Queen Karomama. Mutemhat was another of his wives. Monumental construction was also performed at Thebes, Memphis, Tanis and Leontopolis. Osorkon II also built Temple J at Karnak during the final years of his reign, which was decorated by his High Priest, Takelot F (the future Takelot II). Takelot F was the son of the deceased High Priest Nimlot C and, thus, Osorkon II's grandson. All of Osorkon II's sizeable stone statues are now known to represent re-used works of earlier periods which were only re-inscribed for Osorkon II, including the famous "Cairo-Philadelphia statue of Osorkon II". Osorkon II was the last great Twenty-second Dynasty king of Tanis who ruled Egypt from the Delta to Upper Egypt: his successor, Shoshenq III lost effective control of Middle and Upper Egypt. Many officials are datable under Osorkon II. 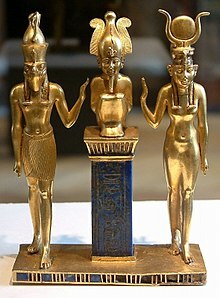 Ankhkherednefer was inspector of the palace; Paanmeny probably was his chief physician; Djeddjehutyiuefankh was fourth prophet of Amun; Bakenkhons was another prophet of Amun under that king. Osorkon II died around 837 BC and is buried in Tomb NRT I at Tanis. He is now believed to have reigned for more than 30 years, rather than just 25 years. The celebration of his first Sed Jubilee was traditionally thought to have occurred in his 22nd Year but the Heb Sed date in his Great Temple of Bubastis is damaged and can also be read as Year 30, as Edward Wente notes. The fact that this king's own grandson, Takelot F, served him as High Priest of Amun at Thebes–as the inscribed Walls of Temple J prove – supports the hypothesis of a longer reign for Osorkon II. Recently, it has been demonstrated that Nile Quay Text No.14 (dated to Year 29 of an Usimare Setepenamun) belongs to Osorkon II on palaeographical grounds. This finding suggests that Osorkon II likely did celebrate his first Heb Sed in his 30th Year as was traditionally the case with other Libyan era Pharaohs such as Shoshenq III and Shoshenq V. In addition, a Year 22 Stela from his reign preserves no mention of any Heb Sed celebrations in this year as would be expected (see Von Beckerath, 'infra'). While Osorkon II's precise reign length is unknown, some Egyptologists such as Jürgen von Beckerath – in his 1997 book Chronology of the Egyptian Pharaohs – and Aidan Dodson have suggested a range of between 38 and 39 years. However, these much higher figures are not verified by the current monumental evidence. Gerard Broekman gives Osorkon II a slightly shorter reign of 34 years. English Egyptologist Kenneth Kitchen, in a 2006 Agypten und Levante article, now accepts that if Nile Level Text 14 is correctly attributed to Year 29 of Osorkon II, then the reference to Osorkon's Sed Festival jubilee should be amended from Year 22 to Year 30. Kitchen suggests that Osorkon II would have died shortly after in his Year 31. Isetemkheb is known to be the mother of a daughter named Tjesbastperu, who was married to the High Priest of Ptah Takelot B.
Djedmutesakh IV was the mother of the High Priest of Amun Nimlot C Nimlot C was a son of Osorkon II and the father of Takelot F/Takelot II. Prince Hornakht was the High Priest of Amun in Tanis Osorkon II appointed Hornakht as the chief priest of Amun at Tanis to strengthen his authority in Lower Egypt; however, this was clearly a political move since Hornakht died prematurely before the age of 10. Other possible children attributed to Osorkon II include his successor Sheshonk III and the King's Daughter Tentsepeh (D), the wife of General Ptahudjankhef, who was himself a son of Nimlot C, and hence a grandson of Osorkon II. David Aston has argued in a JEA 75 (1989) paper that Osorkon II was succeeded by Shoshenq III at Tanis rather than Takelot II Si-Ese as Kitchen assumed because none of Takelot II's monuments have been found in Lower Egypt where other genuine Tanite kings such as Osorkon II, Shoshenq III and even the short-lived Pami (at 6-7 years) are attested on donation stelas, temple walls and/or annal documents. Other Egyptologists such as Gerard Broekman, Karl Jansen-Winkeln, Aidan Dodson and Jürgen von Beckerath have also endorsed this position. Von Beckerath also identifies Shoshenq III as the immediate successor of Osorkon II and places Takelot II as a separate king in Upper Egypt. Gerard Broekman writes in a recent 2005 GM article that "in light of the monumental and genealogical evidence," Aston's Chronology for the position of the 22nd Dynasty kings "is highly preferable" to Kitchen's chronology. The only documents which mention a king Takelot in Lower Egypt such as a royal tomb at Tanis, a Year 9 donation stela from Bubastis and a heart scarab featuring the nomen 'Takelot Meryamun' — have now been attributed exclusively to king Takelot I by Egyptologists today including Kitchen himself. The English Egyptologist Aidan Dodson, in his book The Canopic Equipment of the Kings of Egypt, observes that Shoshenq III built "a dividing wall, with a double scene showing Osorkon II" and himself "each adoring an unnamed deity" in the antechamber of Osorkon II's tomb. Dodson concludes that while one may argue Shoshenq III erected the wall to hide Osorkon II's sarcophagus, it made no sense for Shoshenq to create such an elaborate relief if Takelot II had really intervened between him and Osorkon II at Tanis for 25 years unless Shoshenq III was Osorkon II's immediate successor. Shoshenq III must, hence, have wished to associate himself with his predecessor – Osorkon II. Consequently, the case for establishing Takelot II as a Twenty-second Dynasty king and successor to Osorkon II disappears, as Dodson writes. Takelot II instead founded the 23rd dynasty of Egypt and ruled a divided Egypt by administering Middle and Upper Egypt. The French excavator Pierre Montet discovered Osorkon II's plundered royal tomb at Tanis on February 27, 1939. It revealed that Osorkon II was buried in a massive granite sarcophagus with a lid carved from a Ramesside era statue. Only some fragments of a hawk-headed coffin and canopic jars remained in the robbed tomb to identify him. While the tomb had been looted in antiquity, what jewellery which remained "was of such high quality that existing conceptions of the wealth of the northern Twenty-first and Twenty-second dynasties had to be revised." ^ Osorkon (II) Usermaatre, Digital Egypt for Universities. M.G. Daressy, une Stèle de Mit Yaich, ASAE 22 (1922), 77. This page was last edited on 27 October 2018, at 09:56 (UTC).